Water must be provided by customer and drained before pick up. 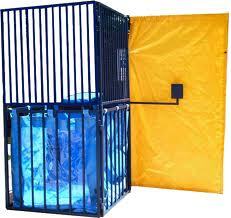 Who does’t like knocking a friend, family member, loved one, or even someone you really don’t like into the dunk tank. Take turns throwing balls at the target to see who has the best aim. Adults and kids are entertained for hours with the dunk tank rentals. You will see are delivery trucks all over Springfield MA, Longmeadow MA, Westfield MA, Enfield CT, Agawam MA, and Chicopee MA area. We pride ourselves on customer service and competitive prices. If you like good quality rental equipment and the lowest prices in Massachusetts and Connecticut than we are your company here at Massachusetts.